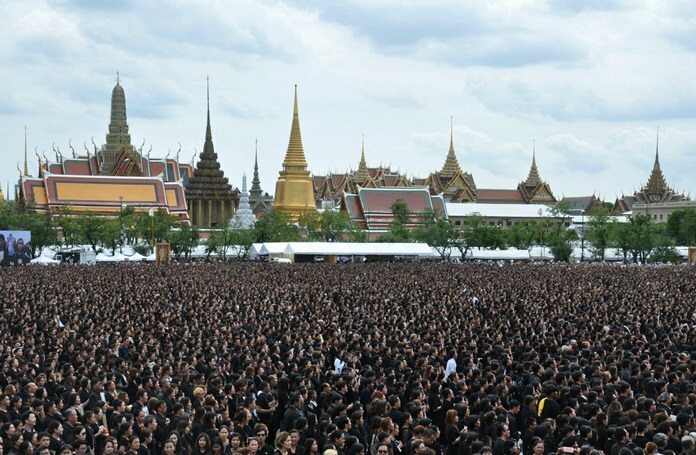 More than 300,000 black-clad mourners packed Sanam Luang and the surrounding areas in front of the Grand Palace on Saturday October 22, to sing a special version of the Royal Anthem in honour of His Majesty King Bhumibol Adulyadej. Another version was recorded Saturday night with the crowd holding candles. Both versions were recorded and will be played on television and at cinemas across the country this week, said M.C. Chatrichalerm Yugala, national artist and well-known film producer and director. In his capacity as the producer of the film about the new version of the Royal Anthem, the honorary president of Federation of National Films said that he intended to shoot the film to pay tribute to the late King and in remembrance of his dedication to the Thai people. 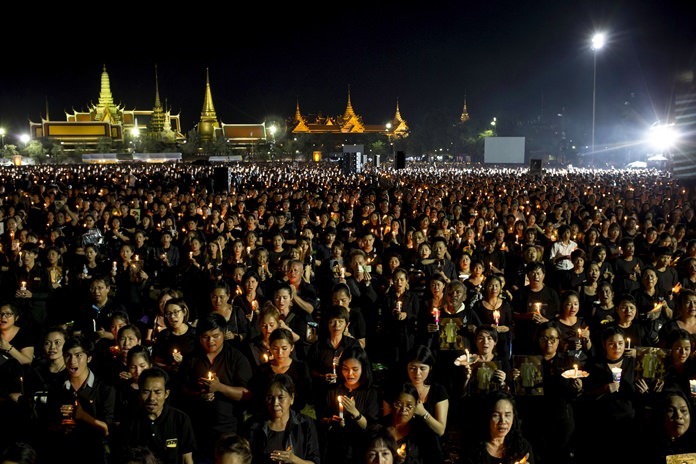 The film project did not require any financial support from the government but it was the joint cooperation of the people who spontaneously showed up in the hundreds of thousands to pay tribute to the late King, said M.C Chatrichalerm. He admitted that he had not expected the crowd to be so huge and said that this special singing event could break the world’s record for having the highest number of singers involved in the singing. Meanwhile, government spokesman Lt-Gen Sansern Kaewkamnerd said Prime Minister Prayut Chan-ocha offered his heart-felt thanks to all the people who were involved in the mass singing despite rains and the hot sunshine.